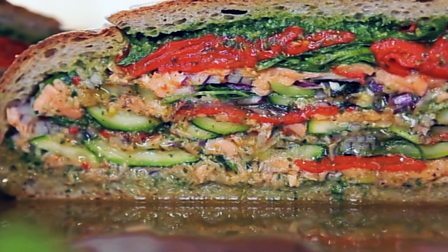 Once prepared this rustic bread stuffed with salmon, peppers, red onions and watercress pesto will keep for days. Perfect for a large picnic party. Place the salmon in a deep-sided tray with the lemon slices, cover with water then place in the oven for 15-20 minutes, or until just cooked through. Remove and allow to cool slightly before flaking the fish into large pieces. To make a pesto, put the basil, garlic, pine nuts and two-thirds of the watercress into a food processor and blend until slightly chunky, then add the oil gradually until it forms a thick paste. Toss the courgettes with a tablespoon of olive oil and season with salt and black pepper. Place on the griddle in batches and cook for 1-2 minutes until just cooked through. Remove and set aside to cool. Take the loaf and cut off the top ¼ and set it aside. Spread some of the pesto into the bottom of the loaf. Place a quarter of the charred courgettes into the bottom of the loaf and press down lightly. Place a quarter of the remaining watercress on top and press down. Top with a quarter of the salmon, peppers, sliced onions and more pesto, then repeat the layers until the loaf is full to the brim, then place the lid back on top. Wrap very tightly in cling film and place in the fridge for at least one hour, but preferably overnight or even for up to three days. To serve, unwrap and cut into wedges.